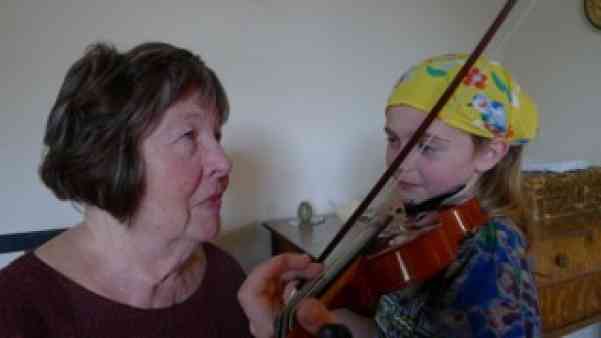 Celia Weiss-Nicks has taught violinists, violists and trained teachers for over half a century (Wow!). She holds a BA and MM in both violin and viola performance from the University of Michigan School of Music where she studied violin with Gilbert Ross and viola with Robert Courte. As a teaching fellow, she taught Galamian violin techniques to University of Michigan music education students. She studied violin and the Suzuki Method with Dr. Suzuki in Matsumoto, Japan as well as here in the states. She also served as a parent while her two young children took violin lessons with Dr. Suzuki as well as Miss Mori. A pioneer of the Suzuki Method in the United States, she founded and directed the Ann Arbor Suzuki Institute in Ann Arbor, Michigan, and later the Suzuki Institute of Seattle. Since 1979 she has been a teacher trainer for the Suzuki Association of the Americas. Celia has also studied the Alexander Technique of body learning in depth. She endorses the technique’s way of attending to body awareness as it applies to string players. A life long musician, she performs on both violin and viola as a freelance musician. Her students have participated in the Seattle Youth Symphony, Seattle Young Artists Festival, as well as many music camps and festivals. While studying with Celia, students have performed with the Seattle Symphony, Northwest Chamber orchestra, and the Octava Chamber Orchestra. Students from her studio have gone on to be professional orchestra musicians, Suzuki teachers, as well as doctors, professors, etc. Celia’s teaching studio is located in Ballard, WA, offering all levels of violin and viola instruction, including teacher training.